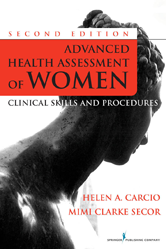 This manual-style reference presents the clinical skills needed to assess health and provide care to women of all of ages, with systematic reviews of all aspects of female mental and bodily health. The authors and contributors comprehensively cover female reproduction, anatomy, and physiology as examined at the cellular level. Also discussed are developmental, psychological, and sociocultural dimensions of women. Offering an integrated approach to women's health care, the authors delineate the roles and functions of various health care providers serving female patients, including physician's assistants, nurse midwives, and nurse practitioners. The chapters present assessment strategies that are on the leading edge of the expanded role of the advanced practice clinician. The chapter authors provide full, in-depth discussions of each assessment skill and technique as well as an understanding of the rationale behind each assessment.